Tonight: the culmination of the grand plans we made over filet mignons. SYB and I went in for some liquid courage before the main event, pre-gaming at Cafetasia before setting out to meet AC and GK at Dean & DeLuca‘s University Place cafe across the street from Bowlmor Lanes. 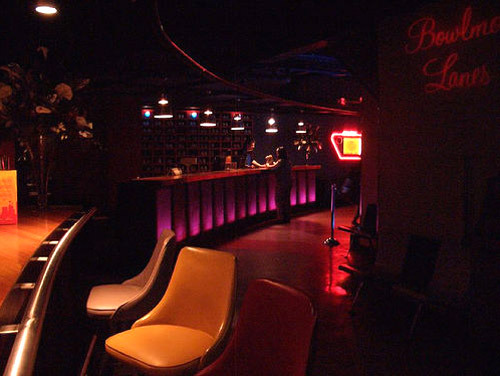 Back in the pre-renovation days, my high school’s bowling class was held at Bowlmor, though one would hardly recognize it as the same space. There was no neon back then; no retro lounge, no plush booths, no DJ or swanky bar… and bowling there was an altogether grimier experience than it is today. Still, for those less athletically inclined — you’d have to be, to select a gym elective during which you could simultaneously eat cheese fries — it was a fun opportunity to hang out downtown with your friends once a week for school credit. We picked up our rented shoes, and claimed our lane. AC’s “new friend” M joined us just as we were about to get started, and promptly established himself as the ringer of our group. Didn’t help that I bowled by far the most abysmal game I’d ever bowled in my life. Can’t even blame the T & T, since I was abstaining that night. I was the only one not trying to impress a potential love interest, though, so in the end it mattered quite little. I like to think that I fulfilled my job in making the others look far more talented and desirable by comparison. SYB checked us out when we were done. 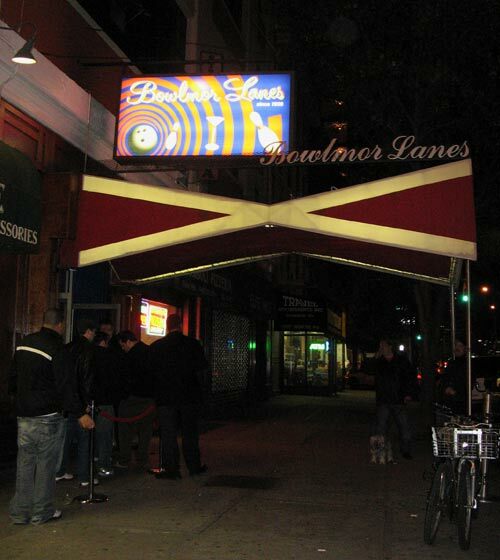 Not for nothing is Bowlmor Lanes the world’s highest-grossing bowling alley… The popular Monday “Night Strike” is a far more economical option, offering shoe rental and unlimited bowling from 10PM to 3AM for $20 per person. Afterwards, the five of us dined at Saigon Grill on summer rolls, eggplant, steak cubes and pho. AC and GK told some funny, if slightly disturbing, dating horror stories. I demurred from contributing, not so much because I’ve had such uniformly positive experiences, but because there was nothing I could say to top having contents from my refrigerator co-opted as souvenirs by a particularly bold overnight visitor.